Car Graphics application is the most effective form of advertising for the visual representation of any business or a professional service. It is a mobile ad that works for you even when you are asleep! Whether your car is parked or it is cruising the streets, if it’s visually branded, it is advertising your service non-stop, 24 hours a day, 7 days a week, 365 days in a year. Graphic Installation crew makes sure the quality of your car wrap graphics application is at the top level so it significantly improves the image of your service or business. Our highly professional team answers your car wrapping requests nationwide, with fast response time. We work with you from the start — from helping you through the process of choosing the best car graphics for your needs, goals, and budget! There are many different types of car graphics and vinyl graphics for cars, from decals, car side graphics, to custom vehicle lettering to vinyl wraps. 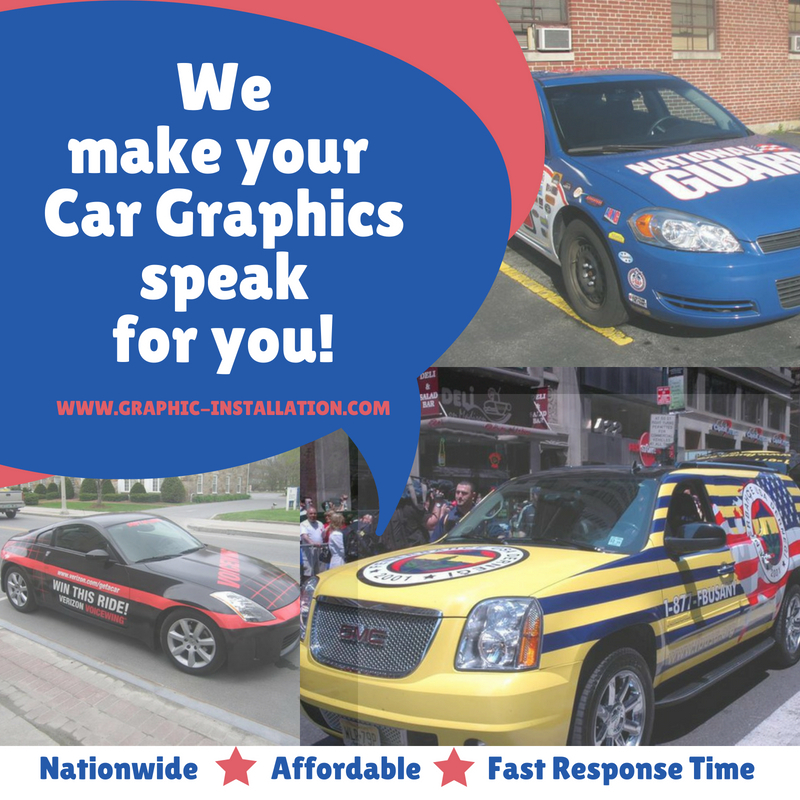 The type of vinyl graphics for cars you want to have on your “moving billboards” depends on what your visual application goal is and the amount of detail you want to show. Of course, on your budget, too. A vehicle wrap is basically a large vinyl decal that is applied over the car’s existing paint. Vehicle wrap designs are customizable and can include your service name and logo, basic contact info and a message. Professional services car fleet graphics can be installed on any vehicle starting from a taxi, police car, an ambulance, firefighter vehicle, all the way to a race car. Car Graphics are a great solution for business, service or personal cars! Vehicle wraps, whether car side graphics, car window graphics, or car lettering, give you endless options to dress up your car exactly the way you want. From partial decoration to full car wraps and custom car lettering, vinyl graphics for cars can make your car showcase your product or service in a truly unique way. Commercial vehicle graphics wraps and car graphics represent the fastest and cheapest way to upgrade the look of your car. An added benefit of vehicle wraps is that they provide a protective layer over the car’s paint, which preserves the selling value of the car. We will give the police car graphics the structure it deserves. Installing custom ambulance graphics on your professional service vehicle will enable it to stand out without the sirens. The firefighter graphics applied by our crew is a long-lasting investment. Graphic Installation responds to all request right away! We give your car an affordable makeover or just a retouch in a matter of hours. Our skilled professionals handle urgent requests anywhere in the U.S.! Wrap your Race Car in all forms of wings, stars, action heroes, or your sponsoring brands vinyl graphics. 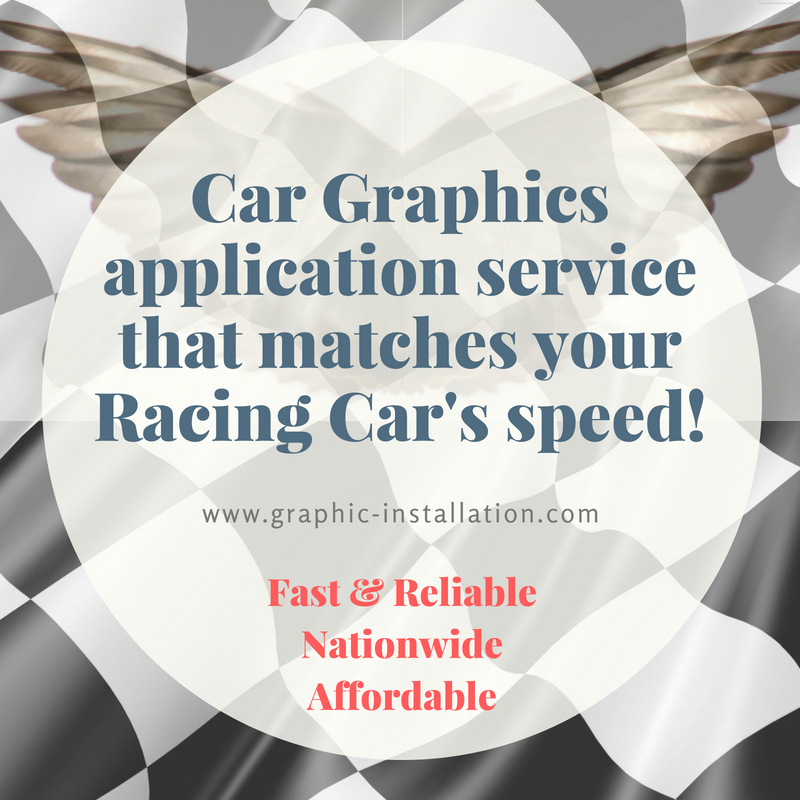 We will take care of your race car vinyl graphics to match its speed. Give it the “lean, mean machine” look it deserves. With Car window graphics, you do not just protect your vehicle, but you also reduce the amount of sun and UV exposure. It decreases the heat inside your ride, making it safer and nicer to ride in. The window foils, the side graphics, the hood applications are our specialty and we never say no to a job no matter how far, how big or small and how challenging your request is! Racing Car Graphics our pro team applies are just a phone call away! Our superior Car Graphics installation solutions are available all across the U.S. Contact us today and make it happen tomorrow, anywhere in the country! On the Subject of Car Graphics, Our Crew Passed With Flying Colors! Graphic Installation Crew is a team of skilled, experienced, and dedicated professionals who can help you with vehicle graphics marketing. Our expertise enables us to passionately focus on any and all details involved in the visual application of car vinyl graphics. It can be custom car graphics, vinyl window graphics, vinyl hood graphics, and any kind of car wrap graphics application. That’s entirely your choice. We are here to advise and help you choose the best vinyl graphics for cars and assist you to excel at vehicle graphics advertising. When it comes to quality control, your service car is in reliable hands with our highly proficient crew. We are fully armed for visual applications on the most complicated of surfaces, on all types of cars! Wherever you are across the U.S. all you need to do is to contact us and we will come to the rescue! We are reliable, dependable and passionate about our work and we beat any other company that installs commercial vehicle graphics wraps anywhere in the U.S. Our professional crew will go the extra mile for your satisfaction and offer affordable prices! Just give us a call at (888) 888-5715 and find out for yourself.